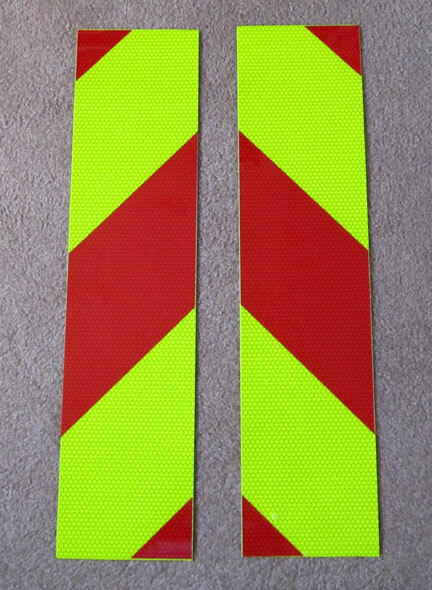 Our pre-made reflective chevron panels are available in red on fluorescent lime yellow, orange on fluorescent lime yellow, red on white and orange on white. 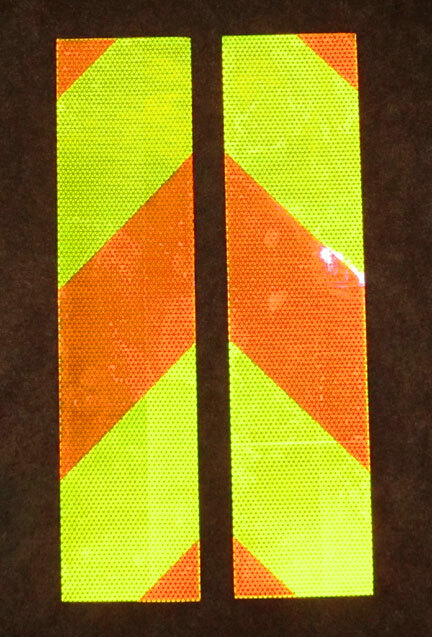 The red on fluorescent lime is the most popular and is the color combination required on most fire apparatus. 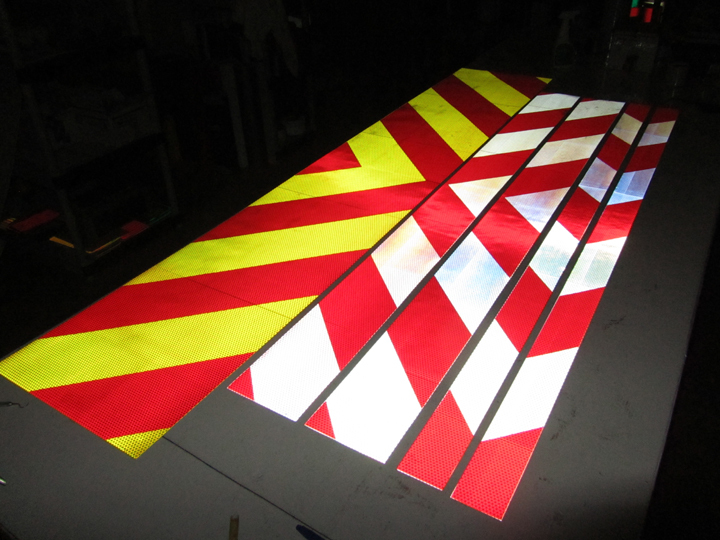 On this page we have pictures of some of our chevron panels and also some of our non slanted reflective panels. 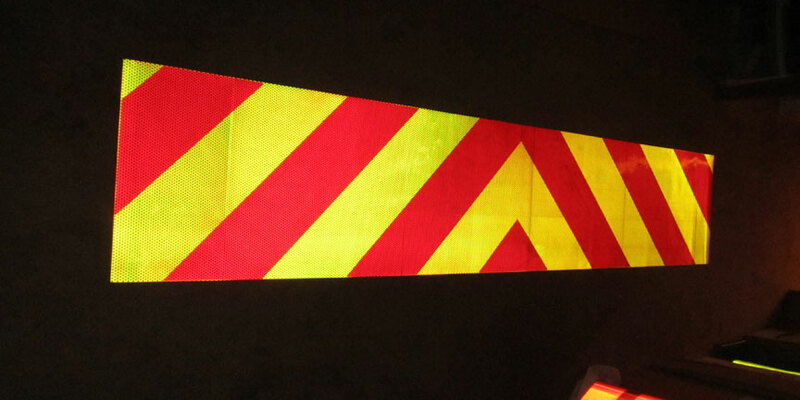 These reflective panels can be used for trucks, vans, trailers, fire trucks, ambulances, motorcycles and more to provide maximum day and night time visibility. Studies have shown that using high visibility reflective panels on vehicles can reduce rear end collisions by up to 50%. The panel to the left (top) is often used on delivery or utility vehicles. They are sold in pairs and are designed to go on the rear of a vehicle either in the vertical position or horizontal in some cases. They are most effective when placed as low as possible on the vehicle. This way car headlights strike the panel directly. The panel to the left is the same as the one above except the color scheme is orange over lime. Red on Lime and Orange on Lime are both highly visible color combinations. The main goal is to mark the vehicle with a color combination that is conspicuous and does not blend in with the vehicle. For example, red and white panels tend to not stand out on a white truck since those two colors are already on the truck and blend in with the panel. 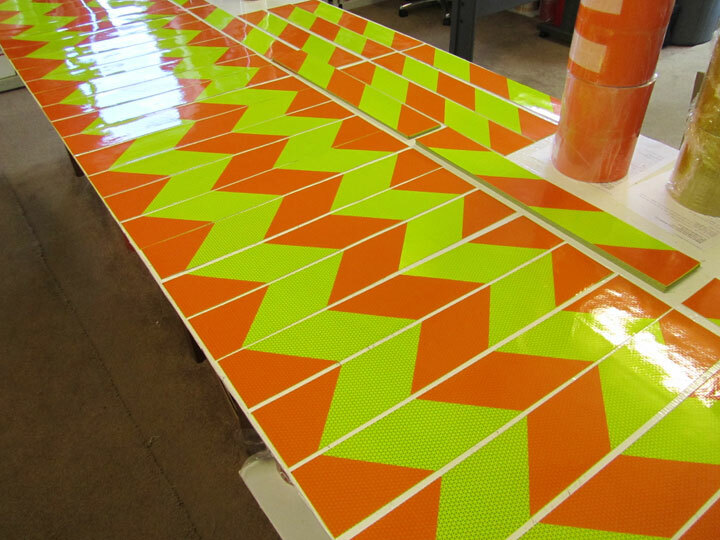 An orange and lime panel, however, will stand out since those colors are not normally on the rear of a truck which makes the panels conspicuous. The panels below are designed to be placed horizontally on a vehicle. Our horizontal panels are designed to where they slant both left and right. The first ones below are 5″ x 64″ long panels. They can be made longer if necessary. We also carry 6″ wide panels just like the ones below. The panel above is a 12″ x 6 foot panel with 3″ wide stripes instead of 6″. The panels above are part of a large order we did for a service company in California. This was for one of their fleets. They had serious issues with rear end collisions. The goal is to reduce these collisions by half through the use of high visibility panels and increased driver training. 16″ x 6 foot large panel and some white and red panels. Lime and Red tends to be more conspicuous since those colors are out of the ordinary and get a viewers attention.